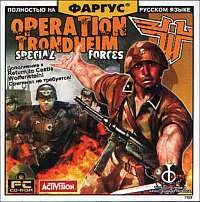 This is the first in a trilogy of pirate Russian-made add-ons combined with the original game Return To Castle Wolfenstein that were intially released as a retail products but have been allowed to be downloaded as separate mods. More or less similar maps can be played for British, Russians and Germans respectively. The German troops had occupied the Norwegian port of Trondheim, which is a very important military object - a radar base which covers the northern seas. Because of this, the Allied forces were cut off from support from the north. Germans intercept convoys of all software. Your task - to destroy at any cost the radar in Trondheim and wait for the main landing Allied forces. Failure of the operation is not allowed!